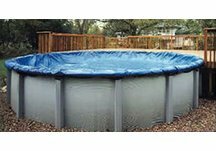 "The round pool cover was delivered before the estimated delivery date and was exactly as described. Thanks for the great customer service." When you protect your pool this winter, you'll be glad you did next spring! When combined with a proper winterizing program, AQUACOVER Solid Winter Covers will protect your pool from the wear and tear of freezing winter weather and eliminate costly maintenance and spring cleanup. We use the best material with the highest concentration of UV stabilizers to ensure your cover will last for years. We also back our covers with the best warranties in the business! Our winter pool covers are made from tough polyethylene fabric with reinforced seams that won't rip, fray or come apart! They are also double stitched with water, chemical and sun resistant thread and feature rust-resistant aluminum grommets. Our above-ground winter pool covers come with a sturdy winch and cable to secure the cover to your pool. We also recommend the use of an air pillow, which can be found on our Pool Cover Accessories page. 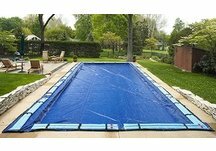 Our in-ground winter pool covers have optional water tube kits available to help secure your cover. If you would rather purchase these water tubes individually, they can be found on our Pool Cover Accessories page!